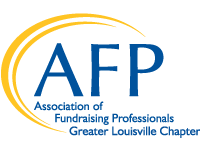 The Greater Louisville Chapter of the Association of Fundraising Professionals is one of the most active chapters in the nation, offering members the opportunity to connect with colleagues, engage in creative thinking, network with new friends and achieve great results in their work. The Greater Louisville Chapter is the key resource for fund raising and nonprofit professionals in our region. At regular meetings of our chapter, members build relationships and learn best practices from other skilled nonprofit leaders. Our educational opportunities include regular meetings, Greater Louisville Philanthropy Day, audio conferences, and review for CFRE certification.